* The admission fees listed on the right are those for viewing the entire museum. *If you need a wheelchair (free of charge), please inquire at the reception desk. *Admission is free on Saturdays for elementary, junior and senior high school students living in Tottori Prefecture. * A wide variety of discount plans are available. For details, please contact us. ※Group discount and use can’t be done. ■ Mon., Wed., Thu., & Fri.
*Super Hakuto, Super Inaba, Super Matsukaze, Super Oki, Hamakaze, etc. → Take a bus bound for the Sand Dunes/Iwai for approx. 15 mins. and get off at Watanabe-bijutsukan-mae (Watanabe Museum of Art). → Alternatively, take a Loop Kirin-jishi Bus, and get off at Watanabe-bijutsukan-mae. Taxi (directly to the museum)/ approx. 10 mins. 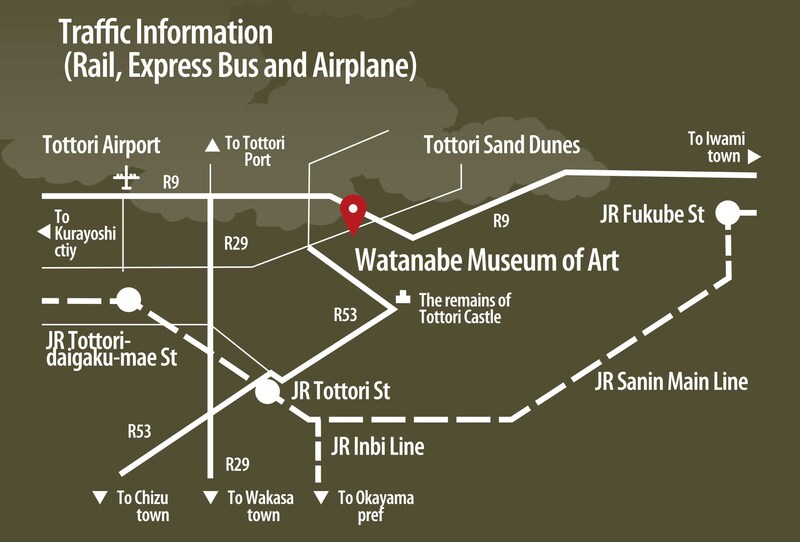 * Terminal bus to Tottori Station – approx. 20 mins. Copyright Watanabe Museum of Art. All Rights Reserved.